A multi-year restoration effort culminates this Memorial Day, Monday, May 30, 2016, with the reopening of Aurora’s Grand Army of the Republic Memorial Hall and Museum in downtown Aurora. A ceremony re-dedicating the GAR Hall and Museum will be held during pre-parade events, beginning at 11 a.m. on Memorial Day, Monday, May 30, at the parade reviewing stand, across the street from the GAR Hall, in front of the David L. Pierce Art and History Center, 20 E. Downer Place. Civil War re-enactors of the 36th Illinois Infantry Regiment will post the colors for the ceremony. The Memorial Day parade begins at noon and the GAR will be open following the parade until 3 p.m. The GAR Museum is a memorial to area veterans of the Civil War. Built in 1877-78, GAR Memorial Hall, Post 20, was closed in the mid-1990s because of structural concerns. But after a 15-year restoration project, the historic building at 23 E. Downer Place in downtown Aurora, will reopen in time for Aurora’s Memorial Day celebration. Reopening Aurora’s GAR Memorial Museum on Memorial Day 2016 is particularly appropriate since 2016 marks the 150th anniversary of the founding of the national Grand Army of the Republic veterans organization in 1866. The GAR project has focused on restoring and stabilizing the exterior of the building, and restoration and creation of exhibits for the Angel Room, the main display area. For the reopening, the Angel Room is filled with unique exhibits on the Civil War and the GAR, on the brave Aurora soldiers who joined in the fight, and on everyday life in post-Civil War America. The $3.5 million restoration effort – involving about 80 percent local funding – was assisted by grants from local, state and national organizations. Grants were awarded to the project from the Kane County Riverboat Fund; the Partners in Preservation Chicagoland initiative, with American Express and the National Trust for Historic Preservation; the Illinois Department of Commerce and Economic Opportunity; and Illinois Department of Natural Resources. Dedicated on July 4, 1878, the GAR Hall was a place of refuge for Civil War veterans to gather, socialize, and cope with the horrors of the battlefields. And it was a community centerpiece for the rapidly growing city of Aurora in the late 19th and early 20th centuries. Construction of the GAR Hall was funded entirely by contributions from Aurora residents, and the Hall was built on land donated by Aurora businessman Joseph Stolp. 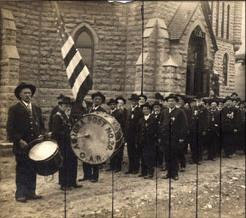 Over the next 70 years, more than 700 veterans from 70 Civil War regiments would become members of GAR Post 20. To date, the GAR Museum collection has more than 2,500 artifacts – photographs, scrapbooks, medals, flags, and items dating from the Civil War through the Vietnam War. At the GAR Research Center, in the David L. Pierce Art & History Center at 20 E. Downer Place — across from the GAR Museum — residents and researchers can find assistance and access to the Museum’s many artifacts. Parts of the collection also can be viewed at the GAR Virtual Museum on the City of Aurora website, www.aurora-il.org. The Aurora Public Art Commission, assisted by the GAR Commission, oversees the GAR Memorial Museum. Assistance is still needed to complete the entire GAR Memorial Museum project. The Museum’s Lower Level and Tower Room are in need of restoration, the historic Sentry statue must be rebuilt, outdoor displays and other work is envisioned. To donate to the GAR Restoration Fund, visit the Aurora Public Art Commission Fund site at the Community Foundation of the Fox River Valley: www.communityfoundationfrv.org/profile/aurora-art-fund/ or 630-256-INFO.